Personality trait models offer a promising framework for organizing the heterogeneity commonly observed among individuals with posttraumatic stress disorder (PTSD). To date, researchers have focused primarily on the ‘Big Three’ temperament dimensions of negative emotionality (NEM), positive emotionality (PEM), and constraint (CON) when evaluating personality heterogeneity in PTSD. NEM broadly refers to a tendency to experience negative emotional states such as anger, anxiety, depression, and vulnerability; PEM represents a tendency to experience positive emotions such as excitement and joy and to be actively engaged with the environment; CON reflects a disposition to avoid harm, minimize risk, and cautiously engage with the environment (Miller, 2003; Rothbart, Ahadi, & Evans, 2000). A personality typology of PTSD consisting of low pathology (low NEM), internalizing (high NEM and low PEM), and externalizing (high NEM and low CON) groups has been replicated in a number of samples (Flood et al., 2010; Forbes, Elhai, Miller & Creamer, 2010; McDevitt-Murphy et al., 2012; Miller, Greif, & Smith, 2003; Miller, Kaloupek, Dillon, & Keane, 2004; Miller & Resick, 2007; Sellbom & Bagby, 2009; Wolf, Miller, Harrington, & Reardon, 2011). Across these studies, individuals in low pathology groups tend to have relatively high scores on functioning measures and fewer co-occurring diagnoses; individuals in internalizing groups have high rates of avoidance, anxiety, and depression; and individuals in externalizing groups have high rates of antisociality, aggression, and substance abuse. These results indicate the usefulness of a temperament typology of PTSD for assessing functional severity and predicting likely patterns of comorbidity. In contrast to temperament traits, which are associated with severity and style of psychopathology, interpersonal traits tend to yield typologies in which groups differ with regard to personality style but do not differ with regard to disorder severity or comorbidity. 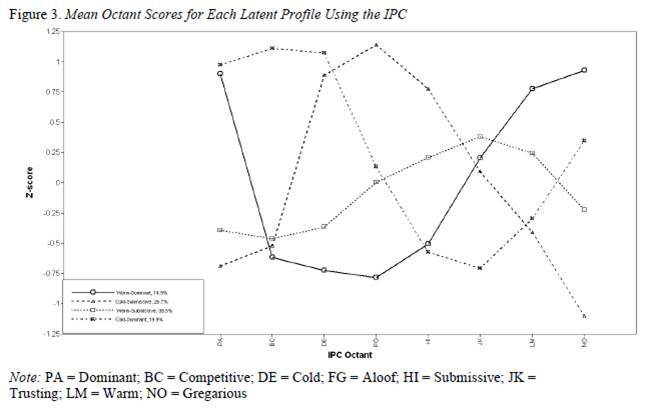 Interpersonal traits can be measured using Interpersonal Circumplex (IPC; see Figure 1) instruments (Leary, 1957; Wiggins, 1996), which assess the orthogonal traits dimensions of dominance and warmth as well as blends of each. Dominance reflects a tendency toward interpersonal assertion (as opposed to passivity); warmth reflects a tendency toward friendly interaction with others (as opposed to distance). Distinct interpersonal groups have been identified among individuals with several forms of psychopathology, including bulimia nervosa (Ambwani & Hopwood, 2009), depression (Barrett & Barber, 2007; Cain et al., 2011), social phobia (Kachin, Newman, & Pincus, 2001), generalized anxiety disorder (GAD; Przeworski, et al., 2011; Salzer et al., 2008), borderline personality disorder (Wright et al., 2013) and fear of failure (Wright, Pincus, Conroy, & Elliot, 2009). Across these studies, interpersonal traits were generally unrelated to psychopathology and functional severity; however, interpersonal traits have been found to relate to aspects of treatment. For instance, individuals with warm and submissive interpersonal styles have been found to have better therapy outcomes than individuals whose interpersonal styles consist of coldness and dominance (Borkovec, Newman, Pincus, & Lytle, 2002; Horowitz, Rosenberg, & Bartholomew, 1993). Drawing from a sample of individuals with major depressive disorder, Cain and colleagues (2012) found that, relative to individuals with dominant and/or warm interpersonal styles, individuals with submissive interpersonal styles did not suffer from a more severe depression at baseline but did experience more chronic levels of depression. Such findings highlight the value of assessing interpersonal traits in clinical contexts. Despite the clinical potential of interpersonal typologies, they have not been investigated in PTSD samples, nor have interpersonal and temperament typologies been compared directly for any psychiatric diagnosis. The goal of this study is to evaluate and compare temperament and interpersonal typologies of individuals with PTSD. We used Latent Profile Analysis (LPA) to empirically identify the optimal number of groups underlying each personality model. We hypothesized that we would replicate Miller’s (2003) internalizing/externalizing/low pathology typology using the Big Three temperament traits as measured by the SNAP. We hypothesized that a typology using interpersonal traits would yield a non-redundant and incrementally useful model of personality heterogeneity in PTSD. Based on research using the IPC with other disorders, we anticipated finding a four-group typology that arrayed around the quadrants of the circumplex. We also tested the extent to which SNAP types and IPC types were redundant by comparing participants’ group membership in each typology. We expected that whereas the SNAP typology would yield groups that varied in their degree of dysfunction and comorbidity, the IPC typology would consist of groups that differed in interpersonal style and prognosis but not in overall distress at the time of the assessment. To test this hypothesis, we examined rates of comorbid Axis I (generalized anxiety, alcohol, and substance use) and Axis II (antisocial and borderline) disorders across groups within each typology. For the SNAP typology, we expected a low pathology group to have the lowest rates of all disorders, an internalizing group to have higher rates of generalized anxiety, and an externalizing group to have higher rates of alcohol and substance use disorders and antisocial PD. In contrast, we did not expect interpersonal groups to differ with regard to rates of these comorbid diagnoses, with the exception that a group high in cold and dominant interpersonal traits would likely have higher rates of antisocial PD – given research indicating that antisocial PD is associated with cold-dominant interpersonal behavior (Hopwood & Morey, 2007; Wiggins & Pincus, 1989). Instead, we predicted that individuals with cold and submissive interpersonal styles would have the longest course of PTSD. This prediction was based on past research implicating poor social support as a maintaining mechanism of PTSD (Markowitz et al., 2009) and research suggesting that cold-submissive interpersonal styles are associated with less social support (Trobst, 2000). Additionally, in a previous study examining interpersonal typologies of depression, individuals with a cold-submissive interpersonal style had the longest symptom course (Cain et al., 2012). Data from the Collaborative Longitudinal Personality Disorders Study (CLPS; Gunderson et al., 2000) were used to test study hypotheses. CLPS participants met criteria for borderline (BPD), avoidant (AVPD), obsessive-compulsive (OCPD), or schizotypal (STPD) PD; or current major depressive disorder (MDD) without a PD. We drew individuals from this sample who also met DSM-IV criteria for PTSD at baseline and completed the primary measures used in this study (n = 155). These participants had a mean age of 33.31 (SD = 7.64) and were largely female (75%, n = 117). The sample racial composition was 72% Caucasian, not of Hispanic origin (n = 112), 18% African-American (n = 28), 8% Hispanic (n =12), and 2% Asian (n = 3). Structured Clinical Interview for DSM-IV (SCID; First, Spitzer, Gibbon, & Williams, 1996). The SCID was administered by experienced clinicians to identify individuals in the CLPS sample who met diagnostic criteria for PTSD. The kappa coefficient for inter-rater reliability of PTSD was .88 (Zanarini et al., 2000). SCID diagnoses were also used to evaluate patterns of comorbidity across distinct groups within each typology. Kappa coefficients for inter-rater reliability of Axis I disorders of interest in a baseline CLPS subsample (n = 52) were: alcohol abuse/dependence (k = 1.00), drug abuse/dependence (k = 1.00), and GAD (k = .63). Scheduled for Nonadaptive and Adaptive Personality (SNAP; Clark, 1993). The SNAP, a 375-item self-report questionnaire, assesses both normal and pathological personality characteristics. We estimated profiles using within-sample standardized scores on the three higher-order SNAP domains (viz., Negative Temperament [NEM], Positive Temperament [PEM], and Disinhibition [low CON]). 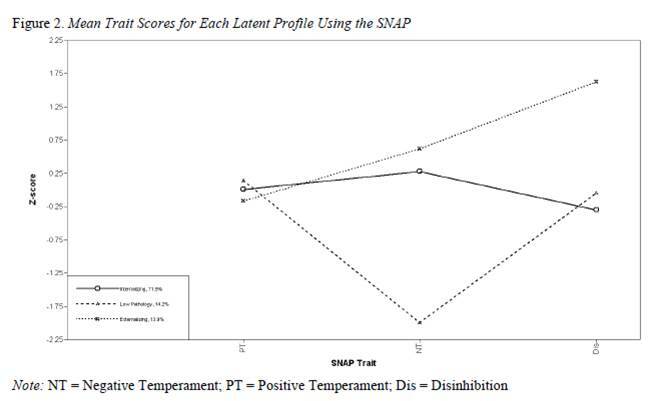 The median internal consistency of the higher-order SNAP scales in the CLPS sample was .89 (Morey et al., 2007). Revised NEO Personality Inventory (NEO-PI-R; Costa & McCrae, 1992). The NEO-PI-R is a 240-item self-report measure that assesses the Five Factor Model (FFM) personality traits. Two factors, extraversion and agreeableness, can be conceptualized as rotated dimensions of the IPC (McCrae & Costa, 1989). Traupman and colleagues (2009) took advantage of this property to develop a method for deriving the eight octants of the IPC from a sub-set of NEO-PI-R items that emphasize interpersonal behavior. We tested the validity of these eight scales as IPC constructs with RANDALL (Tracey, 1997), a statistical program that assesses circumplex structure based on 288 predictions regarding the inter-correlations of octant scales. RANDALL predicts that adjacent circumplex octants should be more highly correlated than opposing octants (e.g., someone high in cold-dominance [octant BC] should be relatively high in coldness [DE] and in dominance [PA], but low in warm-submission [JK]). Results yielded perfect RANDALL structure (288/288 predictions met, Correspondence Index = 1.00, p < .001), suggesting that this measure provides a valid representation of a circumplex model. Internal consistencies for these eight scales ranged from .58 – .77 in this sample. We used within-sample standardized octant scales to classify individuals with PTSD based on interpersonal dimensions. Diagnostic Interview for DSM-IV Personality Disorders (DIPD-IV; Zanarini, Frankenburg, Sickel, & Yong, 1996). Symptom counts from the DIPD-IV, a semi-structured interview assessing diagnostic criteria for DSM-IV PDs, were used to evaluate comorbid antisocial and borderline PDs across SNAP and IPC typologies. Kappa coefficients for inter-rater reliability of the DIPD-IV in a baseline sub-sample (n = 52) ranged from .86 – 1.0 (Zanarini et al., 2000). Longitudinal Interval Follow-Up Evaluation (LIFE; Keller et al., 1987). The LIFE, a semi-structured interview that was used to assess the longitudinal course of PTSD, was administered at baseline, six-month, and each annual assessment over the ten-year course of the study. For the purposes of our analyses, PTSD was coded as either remitted (0) or [partially or fully] present (1) based on symptoms experienced during each week of the 10-year study. These scores, indicating PTSD chronicity, ranged the possible spectrum from 0 – 520 weeks (M = 268.77; SD = 186.49). We conducted LPA in Mplus 6.1 (Muthén & Muthén, 2010) to empirically identify the optimal number of groups underlying each personality model. LPA is a person-centered technique that identifies underlying (i.e., latent) groups of individuals who share similar configurations on specified observed (i.e., manifest) variables. We conducted two separate LPAs on all participants. In the first model we used the three higher-order SNAP traits (NEM, PEM, and CON) as the manifest indicators. In the second model we used the IPC octant scores (PA, BC, DE, FG, HI, JK, LM, & NO) as the manifest indicators. We determined the number of types to retain in each model using the Akaike Information Criteria (AIC) and the Bayesian Information Criteria (BIC). Given our relatively small sample, we applied a sample size correction to the AIC (referred to as the AICc) using the formula provided by Burnham & Anderson (2004). 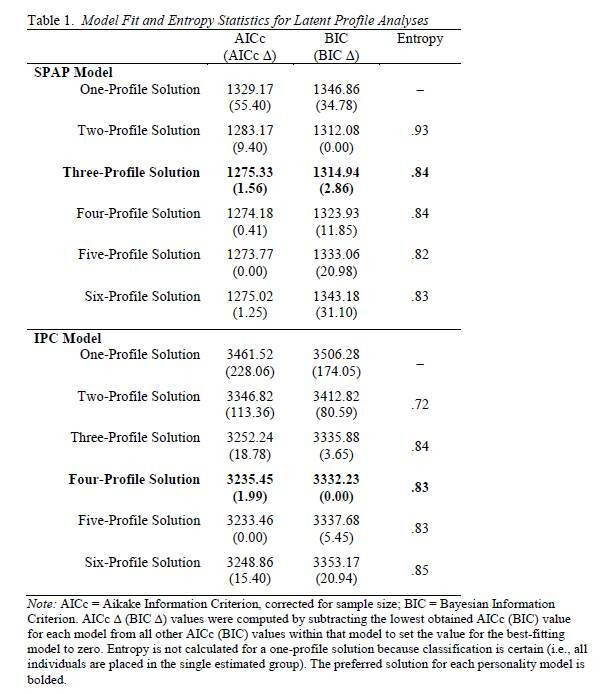 Additionally, to facilitate interpreting model fit across both the BIC and AIC, we subtracted the lowest obtained BIC value for each model from the BIC values obtained for all other solutions within that model (referred to as BIC∆); we did the same for AICc values (AICc∆). This transformation sets the lowest BIC (AICc) value to zero and allows all other BIC (AICc) values to be readily interpreted within the context of the best fitting solution. We also evaluated entropy, which indicates the certainty of classification, for each solution. Entropy values above .80 are considered acceptable (Clark & Muthén, 2012). To test the hypothesis that the SNAP and IPC would yield unique typologies, we evaluated the degree of classification agreement using the adjusted Rand statistic (1971; Hubert & Arabie, 1985). The Rand statistic indicates how similar two classifications are by evaluating the percentage of instances in which they agree upon pair-wise decisions. For example, the SNAP and IPC solutions could agree that participant A and participant B belong to the same profile, or agree that they belong to different profiles. If, however, participants A and B are in the same SNAP profile but different IPC profiles, this would indicate disagreement across the two solutions. We used the adjusted Rand statistic, which corrects for levels of chance agreement. To test hypotheses concerning comorbidity, we evaluated diagnostic patterns across profiles using χ2 analyses. Specifically, we examined whether groups within each typology differed with regard to rates of GAD, alcohol use disorder, substance use disorder, antisocial and borderline PDs. To evaluate PTSD chronicity, we summed LIFE ratings over 520 weeks (10 years) from participants who completed each assessment of the study (n = 137). We compared differences in PTSD chronicity across SNAP and IPC groups using a one-way ANOVA with a post-hoc Duncan test to test the hypothesis that interpersonal characteristics would predict the course of PTSD but temperamental characteristics would not. For the SNAP model, the lowest combined AICc∆ and BIC∆ value was observed for the three-profile solution (see Table 1). This solution also demonstrated acceptable classification certainty (i.e., entropy). The three resulting types were readily interpretable as low pathology, internalizing, and externalizing groups (see Table 2 and Figure 2). For the IPC model, the four-profile solution yielded the lowest BIC∆ value and was also supported by the AICc∆ value (see Table 1). Entropy for this solution was also acceptable. As expected, these four profiles arrayed across the circumplex quadrants and were labeled warm-dominant, warm-submissive, cold-dominant, and cold-submissive (see Table 2 and Figures 1 & 3). We examined overlap between the interpersonal and temperamental typologies using the adjusted Rand statistic (Hubert & Arabie, 1985; Morey, Blashfield, Skinner, 1983). Results indicated very minimal overlap between the typologies (adj. Rand = .05), suggesting that they provide non-redundant information about patient heterogeneity (Table 3). Where overlap was observed, it was highest between the SNAP externalizing group and the IPC cold-dominant group. This pattern may reflect the association antisocial personality pathology shares with both the externalizing spectrum (e.g., Krueger, 1999) and the cold-dominant quadrant of the IPC (Hopwood & Morey, 2007; Wiggins & Pincus, 1989). In general, however, knowing an individual’s group membership in one model does not permit accurate predictions regarding his or her group membership in the other model, suggesting that these two models provide distinct information about personality among the individuals in this sample. Patterns of comorbidity with Axis I and Axis II disorders were assessed using χ2 tests (Table 3). As expected, the externalizing SNAP group had the highest rates of alcohol and substance use as well as antisocial and borderline PDs. Although we expected GAD would be highest for the internalizing group, no significant differences across groups were found for this diagnosis between the externalizing and internalizing groups. However, the low pathology group had substantially fewer individuals diagnosed with GAD than the other groups. As predicted, there were no significant differences between the SNAP groups in weekly PTSD chronicity over ten-year course of the study. Consistent with our expectations, significant differences in alcohol and substance use disorders were not observed across IPC groups and the cold-dominant group had significantly more members who met criteria for antisocial PD. 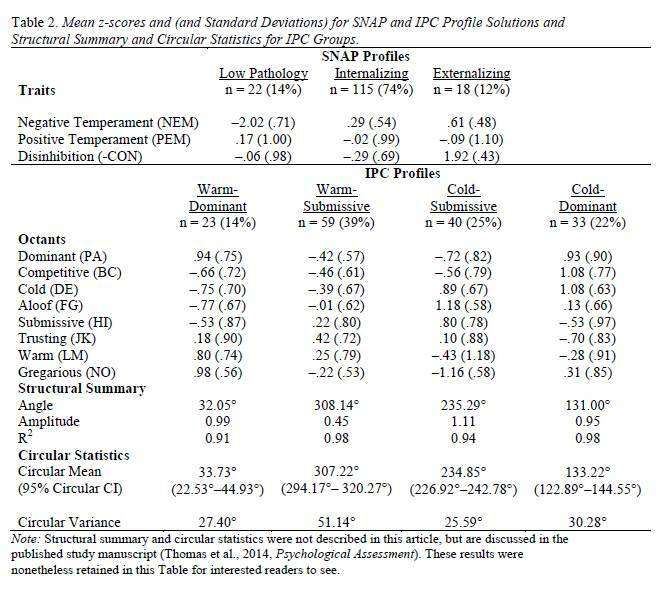 Unexpectedly, individuals in the cold-submissive IPC group had significantly higher rates of generalized anxiety disorder than individuals in the other three groups. Thus, generalized anxiety, at least within this sample selected for PTSD, was related to interpersonal style (however, see also Przeworski, et al., 2011; Salzer et al., 2008). Consistent with our hypothesis regarding the impact of interpersonal style on symptom course, the cold-submissive group had the most chronic course of PTSD during the ten-year study (see Table 4). The purpose of this study was to better understand temperamental and interpersonal variability among individuals with PTSD. Using a measure that focuses on temperament traits related to affective experiences and regulation, we replicated the low pathology, internalizing, and externalizing typology that has been identified in previous research in PTSD samples (Flood et al., 2010; Forbes et al., 2010; Miller et al., 2003; 2004; Miller & Resick, 2007; Sellbom & Bagby, 2009; Wolf et al., 2010; 2011). Individuals in this typology could be distinguished based on the presence of relatively low NEM (low pathology), high NEM and high CON (internalizing), or high NEM and low CON (externalizing). Unlike much past research which has found higher levels of PEM in a low pathology group relative to an internalizing group, mean PEM scores did not differ across groups in our sample. Further, the number of individuals in the internalizing group was disproportionally high. Both of these findings may reflect the severity of disturbance of individuals in the CLPS sample, in whom levels of NEM were found to be higher, and levels of PEM lower, than community norms (Morey et al., 2003). The IPC yielded an alternative perspective on personality heterogeneity that has been unrecognized in previous research with PTSD, although it has been identified in research focusing on other disorders. This typology distinguished individuals with PTSD based on their tendencies to be both friendly and controlling towards others (warm-dominant), to be engaged but passive in their interpersonal interactions (warm-submissive), to have limited interest in interpersonal engagement or control (cold-submissive), or to be competitive and antagonistic with others (cold-dominant). As predicted, this model was not as strongly related to severity or comorbid psychopathology as the temperament-based typology; however, unlike past research (Przeworski, et al., 2011; Salzer et al., 2008), rates of GAD were higher in the cold-submissive group than in other groups. This finding may have been, in part, a function of the composition of the sample. For instance, 25.9% of individuals with GAD also had avoidant PD (see McGlashan et al., 2000 for results from full sample), which was a selection criterion and has been associated with cold-submissive interpersonal behavior (Wiggins & Pincus, 1989). Unlike the temperament model, the IPC typology predicted PTSD chronicity over the ten years of the study. The interpersonal approach to personality assessment therefore appears to complement the more established temperament typology by providing a useful means for conceptualizing how an individual with PTSD is likely to function within relationships and how this might influence symptom chronicity. For instance, given their tendency to withdraw from others, individuals with cold and submissive interpersonal styles may be likely to have fewer social connections than individuals with warm interpersonal styles, which may in turn serve to extend the course of their PTSD (Markowitz et al., 2009). Furthermore, given that interpersonal dominance is associated with agentic goals and behaviors (Kiesler, 1996), individuals with low levels of dominance may be less likely to be agentic in their recovery process compared to individuals wither more dominant interpersonal styles and may therefore experience a more prolonged recovery. Given the utility of this kind of information for treatment planning (Anchin & Pincus, 2010; Pincus et al., 2010), these results suggest that there is considerable value in the clinical assessment of interpersonal characteristics among individuals with PTSD. A broad implication of this study is that temperament and interpersonal models may provide different kinds of information about individuals with the same diagnosis. The groups in the temperament model convey the severity and type of distress an individual with PTSD is most likely to experience. Individuals in the low pathology group experience less functional distress than members in either the internalizing or externalizing groups. Members of the internalizing group may suffer from prominent mood and anxiety symptoms associated with PTSD, whereas those in the externalizing type might be more likely to ‘act out’ or attempt to self-medicate with substances, leading to others kinds of problems. In contrast, interpersonal traits provide context for the way symptoms may be expressed and indicate the rate at which individuals will tend to recover. The results of this study suggest that individuals with cold and submissive interpersonal styles are at risk for experiencing more chronic PTSD, perhaps as a result of their difficulties engaging with social supports to the extent that an individual with a warm interpersonal style might. The IPC profiles can additionally convey the manner and motives of PTSD symptom expression. For instance, social avoidance is symptomatic of PTSD; however, the motive behind such avoidance might differ for individuals with differing interpersonal styles. Whereas a cold-dominant person with PTSD might view others as irritating and unhelpful and thus avoid interactions, a warm-submissive person with PTSD might avoid interactions out of concerns that discussing PTSD-related problems would burden others. 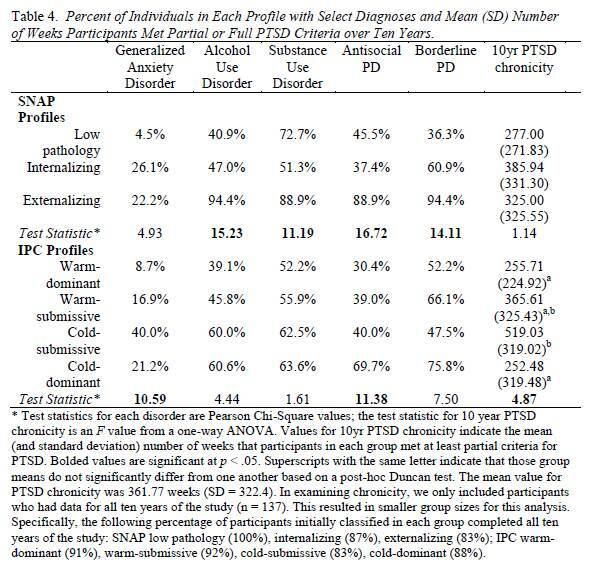 Importantly, these patterns would be expected to hold regardless of whether an individual would be classified as having low pathology, internalizing, or externalizing PTSD using the SNAP model. Whereas previous typological research in PTSD shows that clinical diagnoses can be informed by drawing upon models of personality, the present study demonstrates that it may be useful to assess distinct models of personality for predicting important clinical issues such as comorbid psychopathology and prognosis. This research highlights that constructs broadly falling within the domain of personality may have different meanings for psychopathology and different capacities to indicate factors such as severity, comorbidity, course, and heterogeneity. Ultimately, personality models that focus on temperament traits appear more likely to indicate the severity and type of symptoms, whereas personality models that focus on interpersonal variability appear more likely to indicate style and chronicity. Given the clinical importance of these distinctions, researchers should continue to test the complementarity of these different personality models for describing heterogeneity in PTSD as well as other forms of psychopathology. Ambwani, S., & Hopwood, C.J. (2009). The utility of considering interpersonal problems in the assessment of bulimic features. Eating Behaviors, 10, 247-253. Anchin, J. C., & Pincus, A. L. (2010). Evidence-based interpersonal psychotherapy with personality disorders: Theory, components, and strategies.Evidence-based treatment of personality dysfunction: Principles, methods, and processes, 113-166. Barrett, M.S., & Barber, J.P. (2007). Interpersonal profiles in major depressive disorder. Journal of Clinical Psychology, 63 (3), 247-266. Borkovec, T. D., Newman, M. G., Pincus, A. L., & Lytle, R. (2002). A component analysis of cognitive-behavioral therapy for generalized anxiety disorder and the role of interpersonal problems. Journal of Consulting and Clinical Psychology, 70(2), 288. Burnham, K.P., & Anderson, D.R. (2004). Multimodal Inference: Understanding AIC and BIC in Model Selection. Sociological Methods & Research, 33, 261-304. Cain, N.M. Ansell, E.B., Wright, A.G.C., Hopwood, C.J., Thomas, K.M., Pinto, A., et al. (2012). Interpersonal pathoplasticity in the course of major depression. Journal of Consulting and Clinical Psychology, 80(1), 78-86. Clark, L.A. (1993). Schedule for Nonadaptive and Adaptive Personality: Manuel for Administration, Scoring and Interpretation. Minneapolis: University of Minnesota Press. Clark, S. & Muthén, B. (2012). Relating latent class analysis results to variables not included in the analysis. Submitted for publication. Downloaded from www.statmodel.com. Costa, P.T., & McCrea, R.R. (1992). NEO Five-Factor Inventory. Lutz, FL: Psychological Assessment Resources. First, M.B., Spitzer, R.L., Gibbon, M., Williams, J.B.W. (1996). Structured clinical interview for DSM-IV axis I disorders, patient editions (SCID-P). New York State Psychiatric Institute, Biometrics Research: New York. Flood, A.M., Boyle, S.H., Calhoun, P.S., Dennis, M.F., Barefoot, J.C., Moore, S.D., & Beckham, J.C. (2010). Prospective study of externalizing and internalizing subtypes of posttraumatic stress disorder and their relationship to mortality among Vietnam veterans. Comprehensive Psychiatry, 51, 236-242. Forbes, D., Elhai, J.D., Miller, M.W., & Creamer, M. (2010). Internalizing and externalizing classes in posttraumatic stress disorder: A latent class analysis. Journal of Traumatic Stress, 23(3), 340-349. Gunderson, J.G., Shea, M.T., Skodol, A.E., McGlashan, T.H., Morey, L.C., Stout, R.L., et al. (2000). The collaborative longitudinal personality disorders study: Development, aims, design and sample characteristics. Journal of Personality Disorders, 14, 300-315. Hopwood, C.J. & Morey, L.C. (2007). Psychological conflict in borderline personality as represented by inconsistent self-report item responding. Journal of Social and Clinical Psychology, 26(9), 1097-1107. Horowitz, L. M., Rosenberg, S. E., & Bartholomew, K. (1993). Interpersonal problems, attachment styles, and outcome in brief dynamic psychotherapy.Journal of Consulting and Clinical Psychology, 61(4), 549. Hubert, L., & Arabie, P. (1985). Comparing partitions. Journal of Classification, 2, 193-218. Kachin, K.E., Newman, M.G., & Pincus, A.L. (2001). An interpersonal problem approach to the division of social phobia subtypes. Behavior Therapy, 32, 479-501. Keller, M.B., Lavori, P.W., Friedman, B., Nelson, E., Endicott, J., McDonald-Scott, P., & Andreasen, N.C. (1987). The Longitudinal Interval Follow-Up Evaluation: A comprehensive method for assessing outcome in prospective longitudinal studies. Archives of General Psychiatry, 44, 540-548. Kiesler, D. J. (1996). Contemporary interpersonal theory and research: Personality, psychopathology, and psychotherapy. John Wiley & Sons. Krueger, R.F. (1999). The structure of common mental disorders. Archives of General Psychiatry, 56, 921-926. Leary, T. (1957). Interpersonal diagnosis of personality. New York: Ronald Press. Markowitz, J.C., Milrod, B., Bleiberg, K.L., & Marshall, R.D. (2009). Interpersonal factors in understanding and treating posttraumatic stress disorder. Journal of Psychiatric Practice, 15, 133-140.
and the five-factor model. Journal of Personality and Social Psychology, 56 (4), 586-595. McDevitt-Murphy, M.E., Shea, M.T., Yen, S., Grilo, C.M., Sanislow, C.A., Markowitz, J.C., & Skodol, A.E. (2012). Prospective investigation of a PTSD personality typology among individuals with personality disorders. Comprehensive Psychiatry, 53, 441-450. McGlashan, T.H., Grilo, C.M., Skodal, A.E., Gunderson, J.G., Shea, M.T., Morey, L.C., Zanarini, M.C., & Stout, R.L. (2000). The collaborative longitudinal personality disorders study: Baseline Axis I/II and II/II diagnostic co-occurrence. Acta Psychiatrica Scandinavica, 102(4), 256-264. Miller, M.W. (2003). Personality and the etiology and expression of PTSD: a three-factor model perspective. Clinical Psychology: Science and Practice, 10, 373-393. Miller, M.W., Greif, J.L., & Smith, A.A. (2003). Multidimensional personality questionnaire profiles of veterans with traumatic combat exposure: externalizing and internalizing subtypes. Psychological Assessment, 15, 205-215. Miller, M.W., Kaloupek, D.G., Dillon, A.L., & Keane, T.M. (2004). Externalizing and internalizing subtypes of combat-related PTSD: A replication and extension using the PSY-5 scales. Journal of Abnormal Psychology, 113, 363-345. Miller, M.W., & Resick, P.A. (2007). Internalizing and externalizing subtypes in female sexual assault survivors: implications for the understanding of complex PTSD. Behavior Therapy, 38, 58-71. Morey, L.C., Blashfield, R.K., & Skinner, H.A. (1983). A comparison of cluster analysis techniques within a sequential validation framework. Multivariate Behavioral Research, 18, 309-329. Morey, L. C., Hopwood, C. J., Gunderson, J. G., Skodol, A. E., Shea, M. T., Yen, S., ... & McGlashan, T. H. (2007). Comparison of alternative models for personality disorders. Psychological Medicine, 37(7), 983-994. Muthén, L. K., & Muthén, B. O. (2010). Mplus User’s Guide, v 6.1. Los Angeles, CA. : Muthen and Muthen, UCLA. Pincus, A.L., Lukowitsky, M.R., & Wright, A.G.C. (2010). The interpersonal nexus of personality and psychopathology. In T. Millon, R. Kreuger, & E. Simonsen (Eds. ), Contemporary directions in psychopathology: Toward DSM-V and ICD-11. New York: Guilford. & Berlin, K.S. (2011). Interpersonal pathoplasticity in individuals with generalized anxiety disorder. Journal of Abnormal Psychology, 120, 286-298. Rothbart, M.K., Ahadi, S.A., & Evans, D.E. (2000). Temperament and personality: Origins and outcomes. Journal of Personality and Social Psychology, 78(1), 122-135. Salzer, S., Pincus, A.L., Hoyer, J., Kreische, Leichsenring, F., & Leibing, E. (2008). Interpersonal subtypes within Generalized Anxiety Disorder. Journal of Personality Assessment, 90 (3), 292-299. Sellbom, M., & Bagby, R.M. (2009). Identifying PTSD personality subtypes in a workplace trauma sample. Journal of Traumatic Stress, 22(5), 471-475. Tracey, T. J. (1997). RANDALL: A Microsoft FORTRAN program for a randomization test of hypothesized order relations. Educational and Psychological Measurement, 57, 164-168. Traupman, E.K., Smith, T.W., Uchino, B.N., Berg, C.A., Trobst, K.K., & Costa, P.T. (2009). Interpersonal circumplex octant, control, and affiliation scales for the NEO-PI-R. Personality and Individual Differences, 47, 457–463. Trobst, K.K. (2000). An interpersonal conceptualization and quantification of social support transactions. Personality and Social Psychology Bulletin, 26, 971-986. Wiggins, J. S. (1996). An informal history of the interpersonal circumplex tradition. Journal of Personality Assessment, 66, 217-233. Wiggins, J. S., & Pincus, A. L. (1989). Conceptions of personality disorders and dimensions of personality. Psychological Assessment: A Journal of Consulting and Clinical Psychology, 1(4), 305. Wolf, E. J., Miller, M. W., Harrington, K. M., & Reardon, A. (2012). Personality Based Latent Classes of Posttraumatic Psychopathology: Personality Disorders and the Internalizing/Externalizing Model. Journal of Abnormal Psychology, 121 (1), 256-262. Wolf, E.J., Miller, M.W., Krueger, R.F., Lyons, M.J., Tsuang, M.T., & Koenen, K.C. (2010). Posttraumatic stress disorder and the genetic structure of comorbidity. Journal of Abnormal Psychology, 19(2), 320-330. Wright, A.G.C., Hallquist, M.N., Morse, J.Q., Scott, L.N., Stepp, S.D., Nolf, K.A., & Pilkonis, P.A. (2013). Clarifying interpersonal heterogeneity in borderline personality disorder using latent mixture modeling. Journal of Personality Disorders, 27(2), 125-143. Wright, A.G.C., Pincus, A.L., Conroy, D.E., & Elliot, A.J. (2009). The pathoplastic relationship between interpersonal problems and fear of failure. Journal of Personality, 77, 997-1024. Zanarini, M.C., Frankenburg, R.F., Sickel, A.E., & Yong, L. (1996). The diagnostic interview for DSM-IV personality disorders (DIPD-IV). Mclean Hospital: Belmont, MA. Zanarini, M.C., Skodol, A.E., Bender, D., Dolan, R., Sanislow, C., Schaefer, E., et al. (2000). The Collaborative Longitudinal Personality Disorders Study: Reliability of Axis I and Axis II diagnoses. Journal of Personality Disorders, 14 (4), 291-299. * Author Note: My 2013 SITAR presentation was based on a study that has since been published in Psychological Assessment. This article is an abbreviated version of the full study, referenced below. Thomas, K.M., Hopwood, C.J., Donnellan, M.B., Wright, A.G.C., McDevitt-Murphy, M.E., Shea, M.T., Skodol, A.E., Markowitz, J.C., Grilo, C.M., Ansell, E.B., McGlashan, T.H., Sanislow, C.A., Zanarini, M.C., & Morey, L.C. (2013, September). Personality heterogeneity in PTSD: Distinct temperamental and interpersonal typologies. Psychological Assessment. Advance Online Publication, doi: 10.1037/a0034318. We refer to the three higher-order SNAP dimensions as NEM, PEM and CON throughout this article to maintain consistency with our broader discussion that these dimensions comprise a temperament model of personality.